Very similar to Jedi ready, except that the dominant foot is forward - identical to chūdan-no-kamae - with the lightsaber hilt close to the waist, the blade pointed to the enemy. Slightly more weight is on the front foot than the rear, which means that the dominant leg is still the one that propels the attack. Anakin uses this stance in Episode II. He centers himself by setting his stance and swinging his blade slowly from behind his back, over his head, down centerline of his body, and settling the lightsaber in place. A good defensive posture, defensive neutral is ready for any occurrence but is also non-aggressive. The dominant foot is drawn back and pointed approximately forty-five degrees out to the side. Approximately sixty-percent of the weight is on the back foot. The dominant shoulder is rolled back as the blade is drawn. The lightsaber is held vertically next to that side of the head, in the pocket created by the shoulder. This form is almost identical to the hassō-no-kamae stance found in kendo. In Episode I, Qui-Gon Jinn uses this stance when drawing his lightsaber. His form is almost flawless, showing the years of training and discipline spent acquiring his skill. He holds his lightsaber back in such a fashion that his eyes are able to scan a wide forward arc, looking for targets and watching attacks. With his long legs, he is able to hold his feet wide, ready to spring forward at a moment's notice. In Episode II, Obi-wan has followed in his master's footsteps and picked up this stance, and in Episode III when he is fighting Anakin just before Anakin jumps on to the same platform you see Obi-Wan using the stance. The best defensive posture in sword duel, defensive back is difficult to penetrate, but also difficult to launch an effective attack from. The hilt of the blade is raised high towards the face, the point of the blade pointed diagonally down at the ground. The dominant foot steps back at about a forty five degree angle from your front foot. Your dominant foot supports about 60% of your weight. From this position slashing strikes aimed at the torso can be easily blocked, and stabbing strikes can be quickly parried with wide, sweeping moves from which the defender can quickly move forward into a better stance. Another advantage of this stance is that the blade can be quickly swung all the way around the torso to block attacks from all directions. This is similar to the "Ox" and "Hanging guard" positions of the medieval longsword. Darth Revan in an aggressive back stance and the Jedi in basic neutral. In Star Wars: Clone Wars, Anakin Skywalker assumes a very flashy form of this stance after he and Obi-Wan Kenobi dispatch an entire squad of droids in Chapter 2. A very aggressive stance similar to the Jedi ready stance. This involves standing with more of the weight on the front foot rather than the rear. 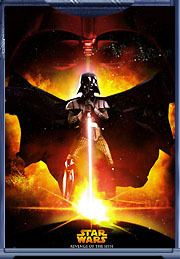 The arms are held so that the hilt of the lightsaber is in line with the solar plexus, and the point of the lightsaber is directed at the target's head. The distance from the body to the lightsaber is greater than most stances. This form is not very useful in conventional duel, but is very deadly in lightsaber-on-lightsaber duel. 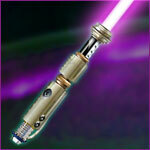 Darth Sidious uses this when he is fighting Mace Windu. Obi-Wan briefly enters this stance twice when fighting with Greivous on Utapau, probably as an attempt keep his own morale up by doing something flashy as though the fight is just a game. The presence of his index and middle finger together with the rest of his offhand enclosed in a fist suggest an uncanny similarity to Tai-chi sword. Combined with the elegant, flowing, and swift motions of Form II, this stance allows Count Dooku to keep his guard up while pressing the attack. Even when facing Anakin Skywalker when Anakin was armed with two lightsabers, Dooku is able to gain an advantage by keeping his enemy at arm's length. A more radical stance than most, aggressive back is a low posture from which a swift attack can be launched. The back-foot is pointed out almost ninety-degrees from the body and is holding over eighty-percent of the weight. The front foot is extended forward, almost straight. The lightsaber is held on the dominant side, right beside the head, its blade facing directly forward. Like aggressive neutral, this stance is only useful for taking on a single enemy armed with a lightsaber, especially since it obstructs view of the right side of the body. This is Obi-Wan's stance from Episode III. He uses it mainly in facing General Greivous, alternating at times with aggressive neutral. This leaves him open to attack from surrounding droids, but he realizes the danger is minute in scope to giving Grievous one inch of advantage. Darth Sidious also uses this stance often during his fights against Masters Windu and Yoda. This stance is fairly simple, and involves holding the lightsaber above the user's head, with the blade facing behind them. It allows the user to easily block a high attack or start a strong downward slash. This stance is used by Darth Sidious at the beginning of his fight with Yoda. During their duel on Geonosis, Darth Tyranus and Anakin Skywalker also use this stance. Anakin again employs it in his rematch with Dooku in Episode III. Mace Windu also uses this stance in his duel against Darth Sidious. This stance is similar to "Jodan no kamae" stance in kendo, where the user would hold his sword above his head. This stance provides broad opportunity for the opponent to attack the user and merely using this style in kendo is seen as a taunt, because the user is often seen to underestimate his opponent. However, attacking moves that can be executed from this stance are mostly unpredictable. The body is sectioned off into "zones", areas to describe a location of an offensive or defensive move, called an attack or a parry, respectively. For example, the move Attack 3 can only be defended against by Parry 3: as the opponent attempts to strike the left side, the defender blocks to the left, parrying his blow. Zones 2 and 3, respectively. Attack 1: A simple, over-the-head strike at an opponent's head. Though not practiced much in duel training, it is a general move performed over and over to practice form and stance. Parry 1: A block where the defender shifts his stance back slightly, and then holds his lightsaber up horizontal above his head. Whether the hilt is to the right or the left determines how the defender wishes to press his following attack. Attack 2/3 Combo: This is a rushing attack where the lightsaber is swung from one shoulder to the opposite hip, brought back up behind the back, and swung down from the opposite shoulder to hip. This X-shaped attack is useful for keeping an enemy busy blocking and unable to counterattack. Parry 2/3 Combo: A natural defense to the Attack 2/3 combo. The blade is lowered to the hip and brought up diagonally to intercept the opponent's blow. As soon as the lightsabers are no longer making contact, the blade is lowered to the opposite hip and the move is repeated. Jedi can get locked in this combo during a velocity, and it is common to see the attack-parry combo continue to get faster and faster, until either attacker or defender gets the upper hand in speed and can press the attack or counterattack. This article or section may need to be cleaned up and rewritten because it describes a work of fiction in a primarily in-universe style. Please edit it according to the guidelines on writing about fiction, or discuss the issue on the talk page. Editing help is available. All ten forms of lightsaber duel utilize these ancient terms used by the Jedi for describing the objectives, maneuvers to use, and the various outcomes that could arise out of a fight involving lightsabers as weapons.